The San Jose Barracuda were victorious against the Stockton Heat. 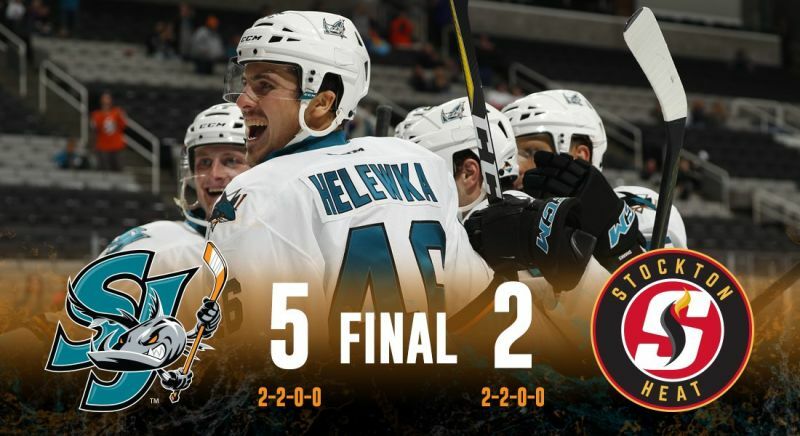 SAN JOSE—The San Jose Barracuda came back from two consecutive losses to earn a win against the Stockton Heat, 5-2. Stockton forward Andrew Mangiapane scored the first goal of the game, almost 18 minutes into the first period. San Jose’s Brandon Mashinter retaliated by scoring less than two minutes later with only 22 seconds remaining. Mashinter, left winger and AHL veteran, was paired on the offensive line with center John McCarthy and right winger Filip Sandberg, who scored the final goal of the game with just under four minutes remaining. Mashinter provided an assist for Sandberg’s goal. McCarthy, another AHL veteran, added that the trio’s confidence built as the game progressed. Forwards Danny O’Regan, Adam Helewka, and Rudolfs Balcers played in harmony as O’Regan notched two goals (he now has a total of four between both games against Stockton this year). Helewka and Balcers assisted each one. O’Regan referred to his two goals as “beneficiary” plays from Helewka and Balcers (an AHL first-timer). The Barracuda got swooped by the Grand Rapids Griffins 7-4 in the home opener, and the Heat defeated them 4-0 in their previous match. This feat seemingly had Coach Roy Sommer thinking about how the evening would end.